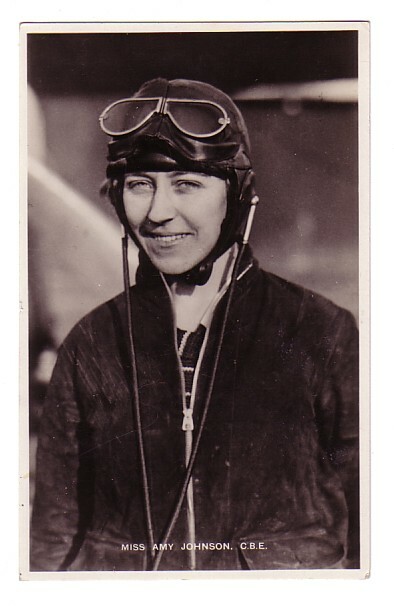 Peter Little , Bromley UK …This is the first postcard I bought when I started collecting Amy Johnson, who typifies what I think of as my era, having been born in 1930. I later found that this was part of a set of 6 by Raphael Tuck and I now have them all in the original envelope. Ray Billings, Swindon, UK …”During October 1934 my mother took me, a 6 year old, to Croydon Airport to see “the biggest aircraft – too big to go into a hangar”. 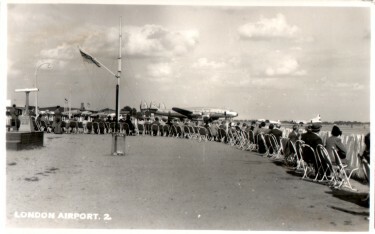 We arrived at the viewing area as the aircraft, a DC-2 swung round to present us its tail and ran up its engines. It filled my eyes with dust so that I buried my head in Mums coat. By the time I opened my eyes the DC-2 was airborne over the distant airfield boundary I still wonder which DC-2 it was Maybe even the KLM “Uiver. 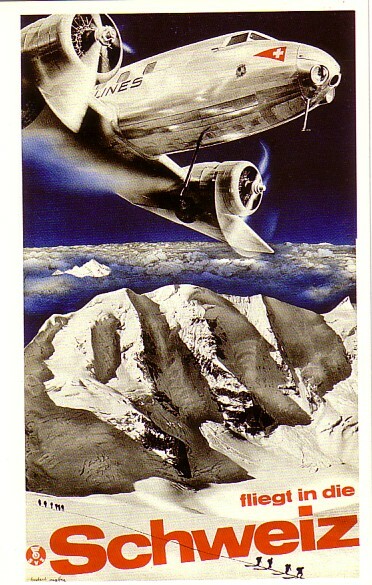 Or a Swissair as on this reprinted poster (Photoglob 1917). Peter White, London NW During WW2, my father, stationed in Egypt for three years or so, took with him a large selection of Salmon cards - ships , trains and aircraft - and used to send them to me (as a then very small boy) regularly. 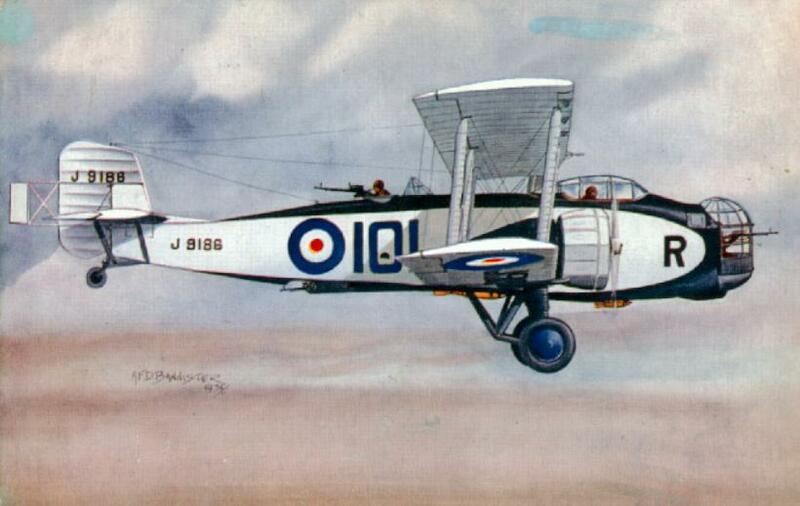 The Bannister painting of the Boulton Paul Overstrand is one that best brings back memories of that collection. 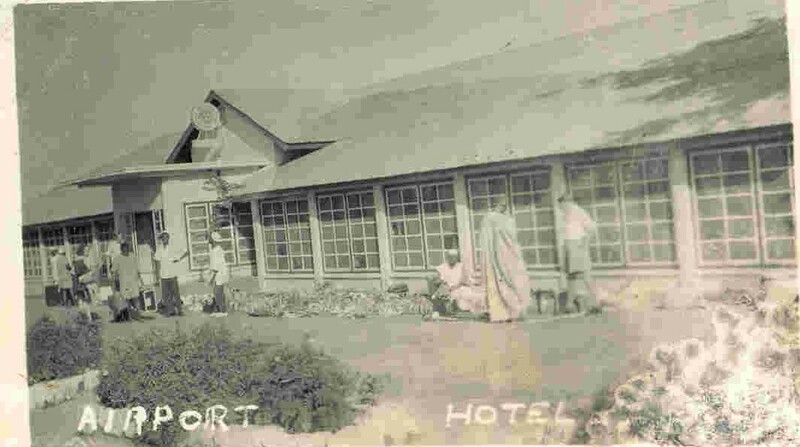 Doug Bastin, Chester UK 1949 first Heathrow visit, gleaming bare metal + red flash American Overseas Constellation, red hot steel seats, only a wooden fence from the taxiway – hooked!. 35 years on, ferreting in a “Transport” section for railway cards, this Wilson of Sunbury card. The rest is history. Jim Davidson, Canada Saw this monster (for the time anyway) at the Farnborough Air Show, at about the same time - it was absolutely huge compared with aircraft of the time and it's image has stuck with me for the past umpteen years. I took a Brownie Box 'snap' as it cleared the landing lights at the south east end. Made a big impression on a schoolboy. 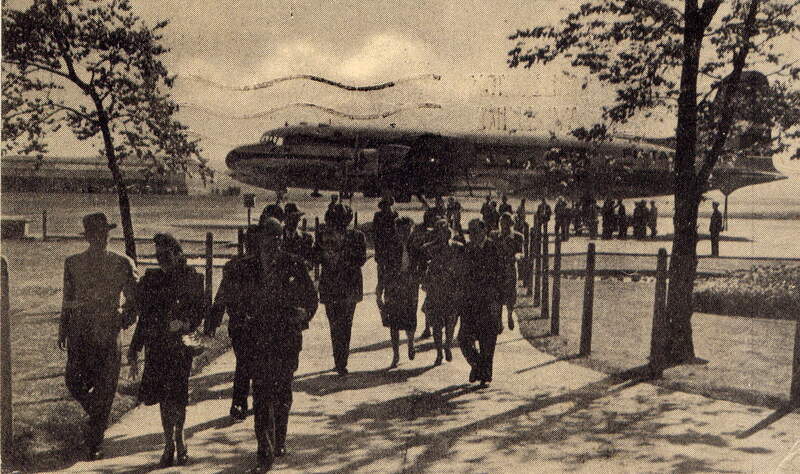 Bristol Brabazon by Valentines. 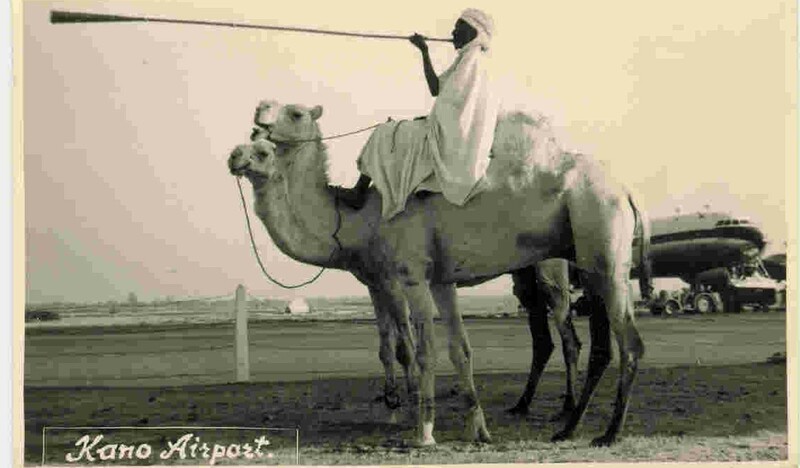 Meanwhile in Australia Ben Sutherland, now USA used to venture out to Mascot Airport (now Kingsford Smith) Sydney every weekend also with a Brownie Box camera. Around that time there were DC-3's, DC-4's, Viscounts, Convair 240's of TAA. DC-3's and Convair 340's of Ansett Airways. DC-3s, Bristol 170 Freighters, DC-4's, DC-6's, DC-6B's of ANA. DC-6's of TEAL. 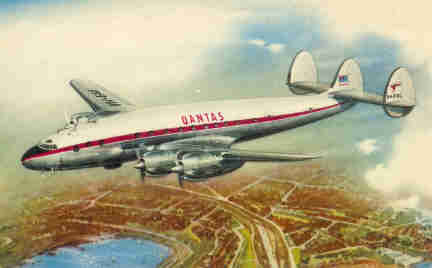 On the International side there were Constellations of KLM and Air India, Stratocruisers of PAA and Britannias of BOAC and DC-3's, DC-4's and Constellations of QANTAS. 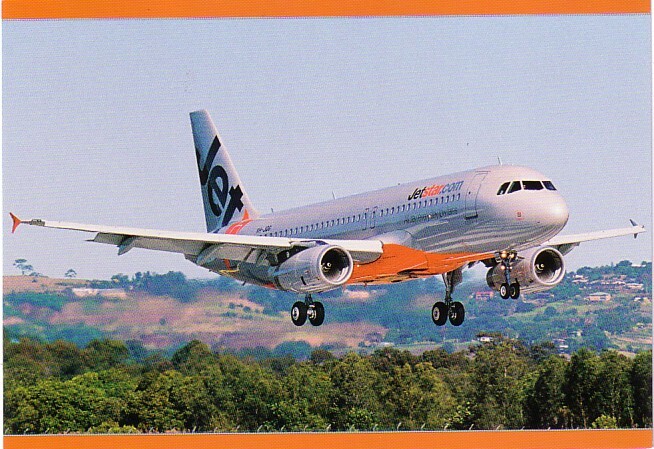 – and this Qantas issue L749 was the first postcard I bought. 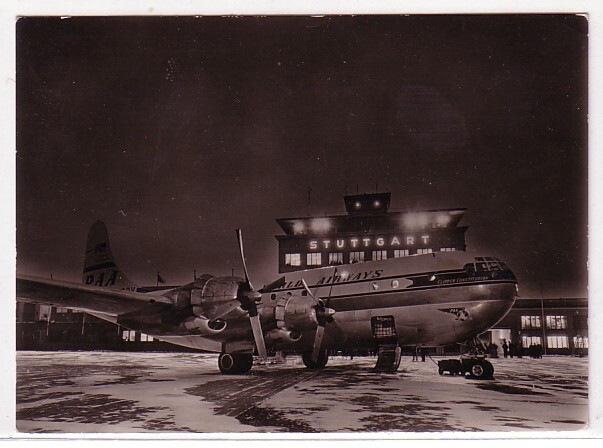 Alan van Wickler, USA was already “toiling with PanAm” in Germany and one of the classic 50s black and white German cards by Zobel of Stuttgart of a Stratocruiser on a winters night there is about as evocative as it gets. Over in the US of A, Bill Baird , was, like Ray Billings 20 odd years earlier, at the airport with mom. “ When I was a kid in Louisiana my mom would take me to Shreveport to go shopping (all day it seemed like), and the bribe was, if I was good, she'd take me to the airport to eat and watch airplanes which were mostly Delta DC7s, 6s, and Convair 440s with an occasional Trans Texas DC3 or Convair thrown in. 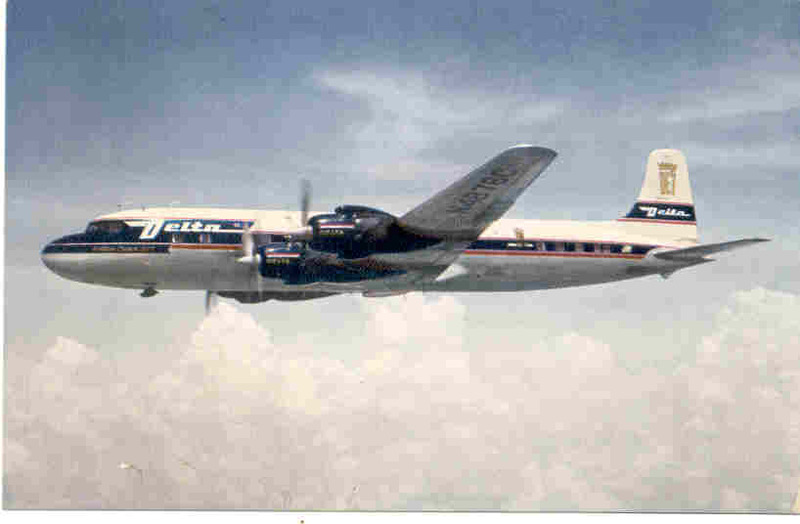 Boy were those the days” Delta issue DC-7..
One more continent, Buenos Aires, Argentina, South America. 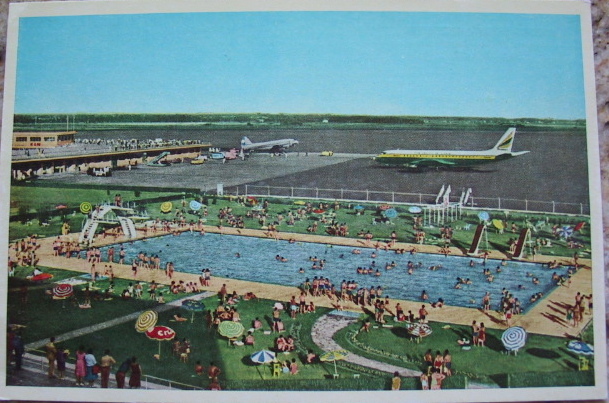 Eugene Siklos, Canada “ OK , enough about the lost airport viewing areas, terraces etc, what I want to know is what happened to the pool” Ezeiza Airport with Canadian Pacific DC-8 attracted by this unique feature. 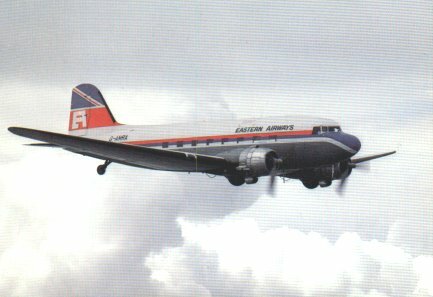 The Pratt & Whitneys were still going in the 1980s when Graham Stringwell, Lincolnshire, UK worked in the stores at Humberside Airport where the Eastern Airlines (UK version) DC-3 fleet was serviced. 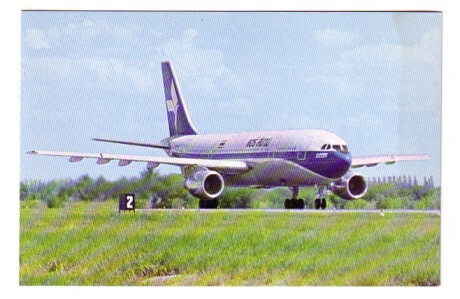 Card of G-AMRA by Skilton for the airline. 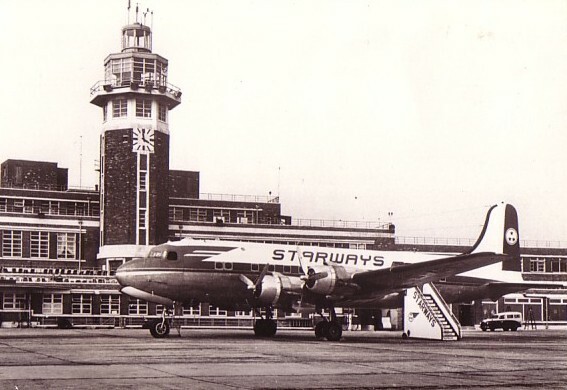 Liverpool old terminal was still in service when Tony Edwards, Cheshire UK started business flying in 1968 on British Eagle 1-11s. This Salmon card had the Eagle titles edited out when Eagle failed later that year. 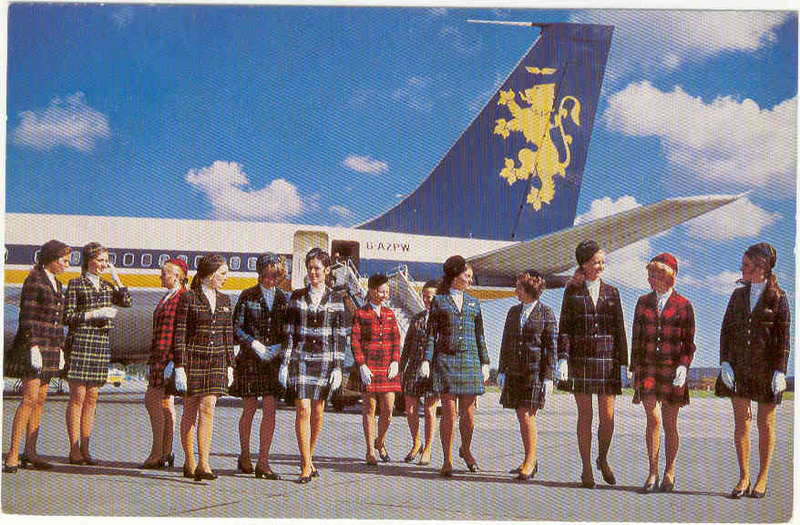 Tony’s actual first business flight was in a KLM DC-8 as on one of the KLM Aerocarto series of black and white cards. But he didn’t start collecting airline cards until some guy called Bastin did a slot at the Chester Postcard Club 20 years on. Simon made it to the flight deck, Ronny Vogt, Switzerland had the dream. 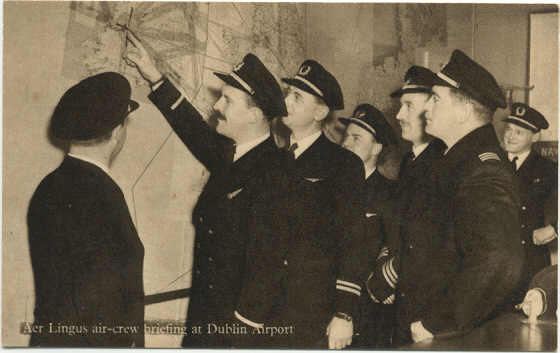 “thirty years ago I should have decided to go for the pilot career. If I had done so I would see such a picture at every Airport ... every day ... stewardesses/flight attendants waving at my arrival .... a nice airplane waiting to be flown to some nice place.... Irish green colours everywhere .... a nice meal served by the most beautiful stewardess you might imagine who feels that you, the pilot, must be the most knowledgeable and desirable man in the world ... and postcards coloured by John Hinde (look at that marvel of an Esso tanker)! Isn't that reason enough to like that card? “ Boeing tail + stewardess again. 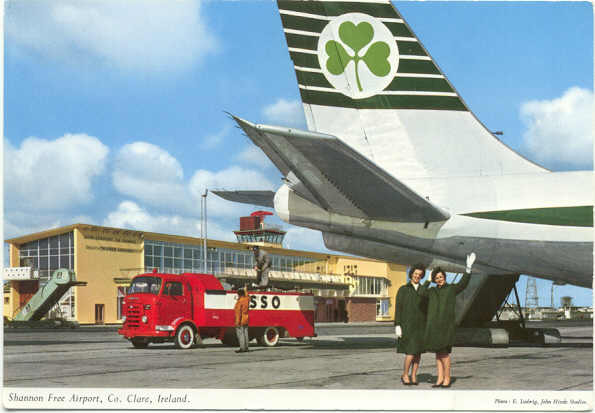 This time Aer Lingus B720 at Shannon by John Hinde – we will see a lot more Hinde cards in the 50. .... and even if the reality is a bit more mundane it makes a good card. Aer Lingus issue from the DC-3 era also from Ronny – they did one of backroom engineers too, working on yet another Pratt & Whitney. 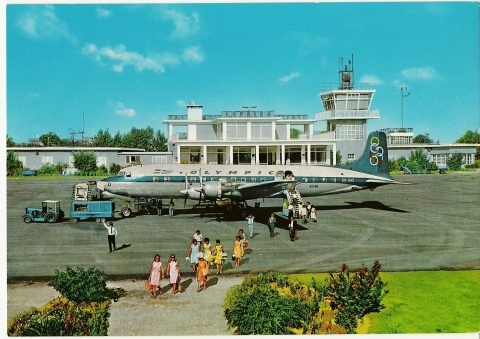 Staying with Irish publisher John Hinde Derek Card, Devon, UK submits one of their cards of Jersey Airport – Hinde loved brightly coloured fuel tankers. 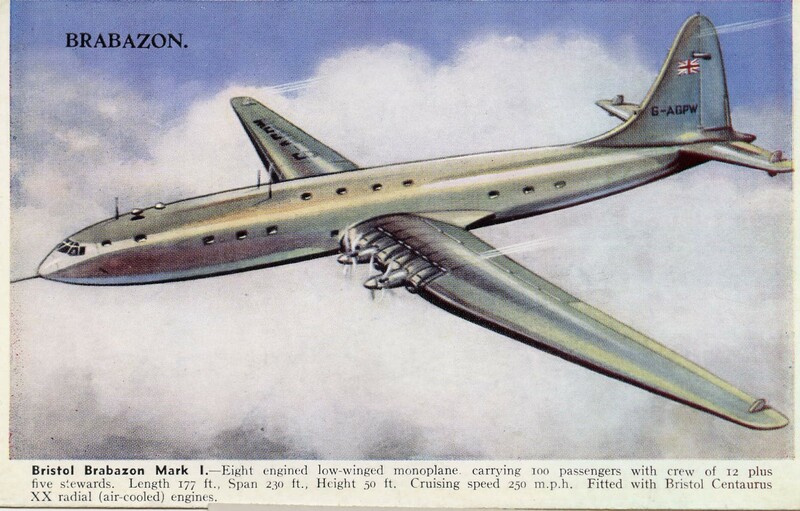 Derek writes “I bought this card after a Viscount flight to the island in 1963. “I was serving with the British Army in Berlin, an isolated city with a dark and forbidding atmosphere. On leave, I travelled to Jersey to meet friends and it was like entering a new world to step into the Viscount and be greeted by a smiling stewardess in the spacious well lit cabin. 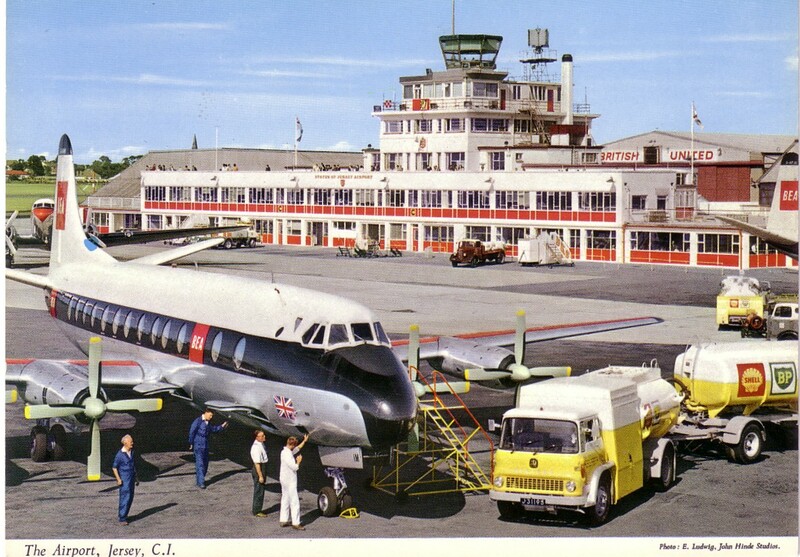 My previous flights had been in BEA DC-3s and Vikings and RAF Beverley and Hastings transports” Apart from Croydon pre-war and Heathrow post, Jersey in the Channel Islands has probably had more postcards published than any other UK airport. Rohan would not count himself among our member/publishers but John Johnston, Glasgow is. 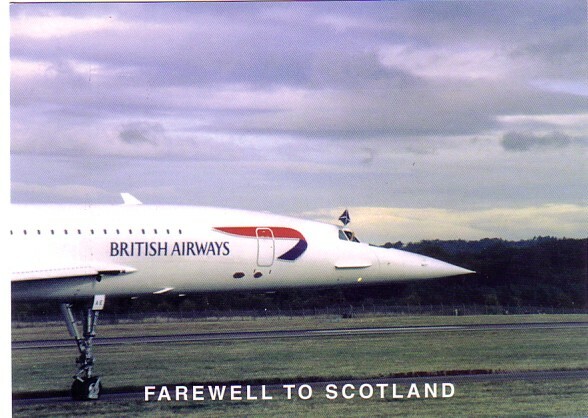 “This postcard was a photograph I took myself of my favourite aircraft, Concorde G-BOAE landing at Edinburgh Airport on the occasion of Concorde's last flight to Scotland. 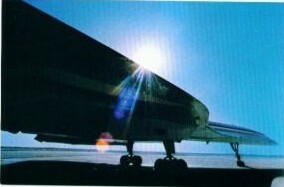 There must have been between 800/1000 enthusiasts of Concorde at the airport that day. The pilot (a Scot!) flew the Scottish Flag from the cockpit which pleased the crowd no end! More collectors tales from Mike Charlton, Newcastle, UK. "On the last day of a family holiday to Corfu in 1980 and after spending 2 weeks looking for cards (as you do! ), as we were boarding the bus from the resort,the small taverna 50mts from the hotel was paid a last visit for water. Another glance at the postcard spinner found a crumpled card of this Olympic DC6 at Corfu Airport. A quick chat to the owner and into his storeroom he went and produced around 25 of these cards in mint condition!! Colin Cohen, London UK ,temporarily displaced from his back page, would surely agree with both Christian and Mike. His message is “It WILL turn up” – and probably when least expected. 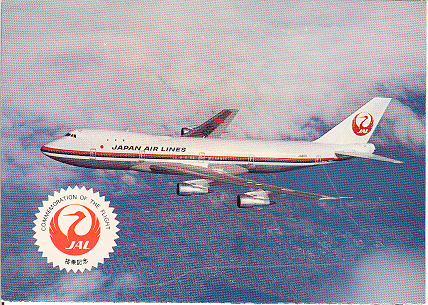 I saw this Air Siam issue A300 at a postcard show in the USA in the late 1970s when I first started to attend the USA conventions and began to collect seriously. I dearly wanted that card but alas it was not to be at the time as the guy who had it wanted only to trade it I never saw that card again for years despite asking everywhere when I used to trade or buy, both here and abroad. 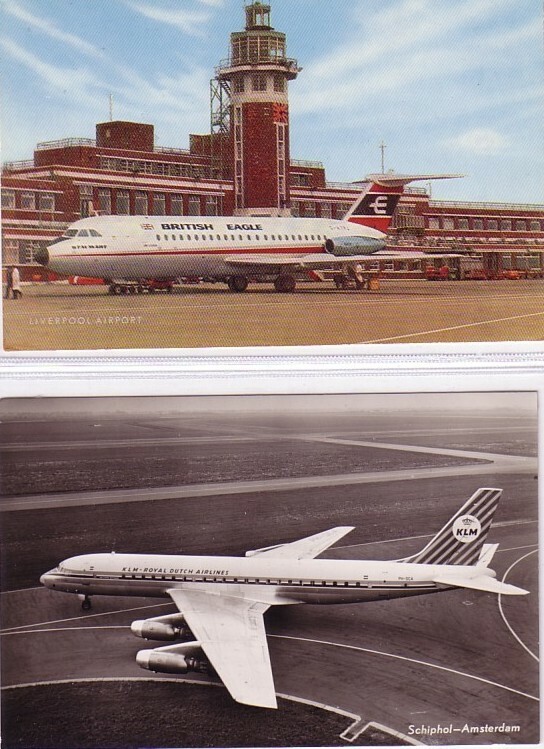 Then some ten years later I was at a show at Heathrow and blow me down someone was selling about seven of the cards on his stand with also some rare Boeing 747 and DC10 cards of the same airline. I remember I just could not believe my luck. The guy was charging around £2.00 for each card which was a fortune in those days, however I dug deep into my pocket and bought the entire lot, I was so glad to find such a super lot for my collection and some traders to swop with my friends, many of whom had never heard of them, let alone seen them before. I have never had such an experience again and it will remain with me for ever.